When Lewis Hamilton stumbled in his last race of the 2007 season and ultimately lost his chance for a debut F1 World Championship, the critics were ready. But what the detractors overlook is the incredible triumph it was just to be there. The presumption with Formula One drivers is that they are the children of privilege; precocious, pernicious brats born into sporting royalty. Certainly some do all they can to confirm that prejudice. Schumacher, for all his undeniable talent, had a mean streak a mile wide. Mansell, one of the most entertaining drivers you’ll ever see, was a legendary dummy-spitter and double world champion, Fernando Alonso, Hamilton’s teammate and by default his greatest rival, would step over the line in his quest to retain the title. Yet throughout that tumultuous season, my greatest memory will be the unqualified sportsmanship and dignity shown by the newest kid on the block. Despite some dirty tricks and stinging barbs, he stayed above it all, focused on his ultimate prize. "I don't know if I particularly believe that 'win at all costs' is the way forward," Hamilton is quoted as saying. It is no surprises then that some of the largest egos in the world belong to Formula One drivers, and when a young black kid from the wrong side of town to turns up and starts whipping them, there are bound to be sparks. Perhaps the most obvious example was the furor created during the so-called “trial by YouTube” when a spectator posted amateur footage of the controversial Japanese GP safety car incident that took out Mark Webber and Sebastian Vettel. Webber, with an appalling finishing record and relentlessly dogged by bad luck, blamed Hamilton for erratic driving, but was later cleared after an FIA inquiry. Author Timothy Collings, who assisted Lewis with the writing of his autobiography ‘My Story’, was straight up with his inquiry. “So Lewis, why do you think some of the other drivers don’t like you? Asked, in 2006, whether he thought his colour would create a sort of “Tiger Woods” effect, replied "It's more a thing for the media to talk about. Being the first black man doesn't matter much to me personally, but for the sport itself it probably means quite a lot." But let’s step away from the issue of ethnicity and look dispassionately at Hamilton’s arrival. He came from a broken home in a rough council estate and went to a school where he was picked on. “Lewis developed his inner steel, belief and determination out of a disciplined response to life's worst setbacks. 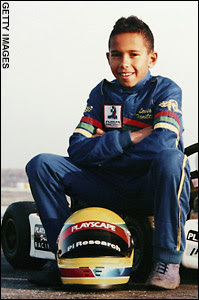 Hamilton was a British kart champion at 10. Yet at primary school, he was bullied. He was small, lacked confidence and felt immature. But he had great inner determination and, with support from his father, he began karate lessons. By the time he was 12, he had a black belt. Murray Walker, the almost retired F1 commentator and intensely parochial Pom, almost sheds a tear when asked about Hamilton. “I have people coming up to me all the time in my local village of Ringwood, in Hampshire, saying: "Murray, is this Lewis Hamilton as good as people say he is?" and I say: "No. He is better." After winning that now famous 1995 British karting title at age ten, Hamilton approached McLaren F1 team boss Ron Dennis at the Autosport Awards evening that December for an autograph, and boldly proclaimed he intended to drive for him one day. Taken a little aback, Dennis apparently wrote in his autograph book, "Phone me in nine years, we'll sort something out then." But clearly Dennis, his interest piqued, could not wait and signed the cheeky lad just three years later, making Hamilton (at 13) the youngest driver ever recruited by an F1 team. "I was amazed by his self-confidence, and thought to myself that this boy can really go places," said Dennis recalling the moment. Under Dennis’s remote guidance and tutelage, Hamilton went on to dominate very race series he entered prior to 2007. But now with the tribulations of that defining debut season behind him, his otherwise flawless reputation slightly chipped, but his dignity firmly intact, how does Hamilton intend to approach 2008? Mark Blundell, former F1 driver and Hilton Racing Ambassador, says, "The next part of the journey will be fascinating. If things pan out as we think now that Alonso has left McLaren, then Hamilton becomes their number one. That is a new dimension again. This year he had the element of surprise. He won't have that in 2008. Expectations are now sky high. He has to deliver in new circumstances. We are all in new territory with him."